The Lups already have the Collection Piece as they take care of Golems and safe-head Podamans. Destra and Goche are observing the proceedings for Goche’s experiment. 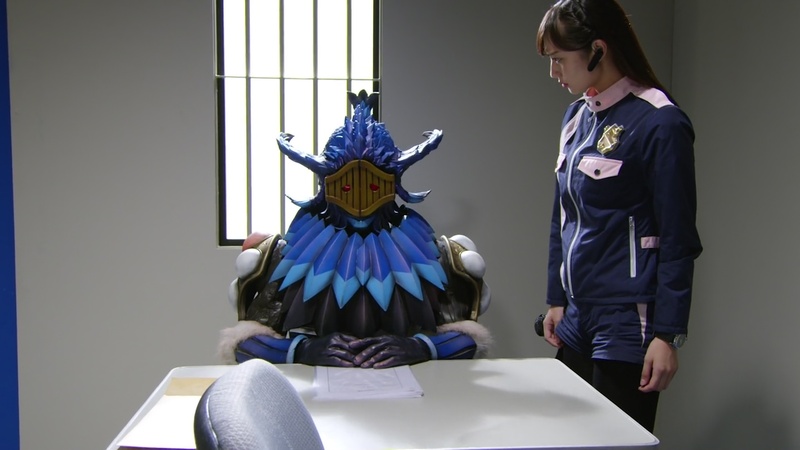 At the GSPO, the Pats are interrogating Yoshi who says he wants to change and live a peaceful life. He’s give them important Gangler information in exchange for leniency. Noel insists the Gangler won’t ever tell the truth, but the Pats and Commander Hilltop are willing to give him the benefit of the doubt. Jim Carter says a little bit of new info might be worth the risk. Sakuya has an idea on how to get the information without making a plea deal. He and Keiichiro dress up as detectives and give it a try. Sakuya takes the lead, but while Yoshi humors him for a little bit, it doesn’t work. Sakuya has another plan, but this time it involves Commander Hilltop and Jim Carter dressing up as very familiar characters. It doesn’t work either and Yoshi points out that Hilltop and Jim Carter seem to have their characters switched. But Sakuya’s got one last idea, this time for Tsukasa and Noel. Tsukasa says she’ll just question Yoshi normally and asks Noel not to be too touchy-feely with the safe. Yoshi is in GSPO Japan’s custody, not GSPO France HQ. Tsukasa asks why Yoshi was being chased by Podamans, but he doesn’t want to answer. She presents him with the documents for the plea deal and his new identity. Noel notices Yoshi’s safe glowing as he is excited to see the papers. Down in the underworld, Goche prepares the fruit of her experiment. She finds there is a delicate balance between more safes on a Gangler and the ease of control with so many. 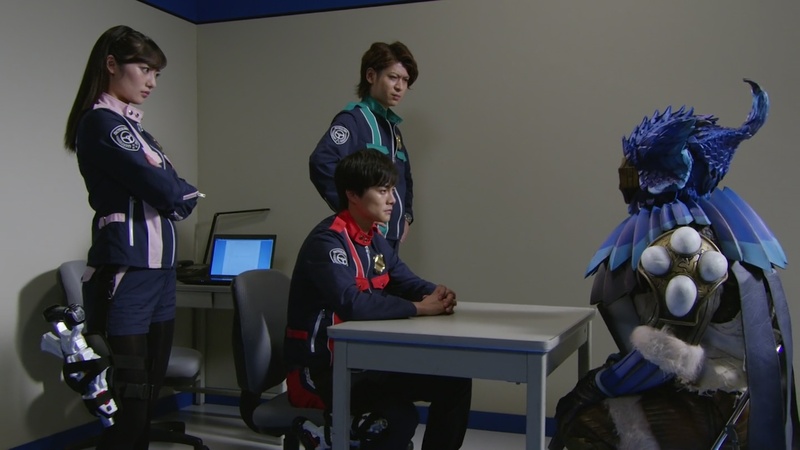 Back at the GSPO, Tsukasa reports to Commander Hilltop and says they’re making good progress with Yoshi. Commander Hilltop says she can continue to take the lead. Noel asks to speak with Tsukasa and warns she shouldn’t get any closer to the Gangler. Tsukasa says if Yoshi really regrets his past actions, then offering him a plea deal is fine. Noel says he should’ve, but Tsukasa was being so sincere. Kairi says he gets it and Umika wonders if there’s a way to take the Piece without hurting Tsukasa. Tooma says the longer they wait, the more Tsukasa will be hurt. Tsukasa meets with Yoshi and says his application has been approved. She asks what he will do with his new life. Yoshi wants to go back and enjoy his youths. He imagines what that could be like. High school Keiichiro wants to be a policeman when he grows up. High school Sakuya wants to be a YouTuber. Tsukasa wants to be the head of the stuffed toy department at a toy company. Yoshi wants to be a good housewife. Tsukasa says that’s interesting. And to celebrate, she brings him a bowl of katsudon. She sits down to eat with him. He finishes his bowl quick. Tsukasa sees there’s some rice on his lip and she takes it and eats it. Yoshi decides to tell her that his injury is because of Goche’s forced experiments including ripping off his safes. Before she could rip off his last safe, he was able to barely escape. He warns Tsukasa to be careful of Goche as she gathering up safes for something crazy. She thanks him for the information. Later, Noel calls someone in France. Next day, Commander Hilltop tells Tsukasa that France HQ called and they want Yoshi transferred to them immediately. 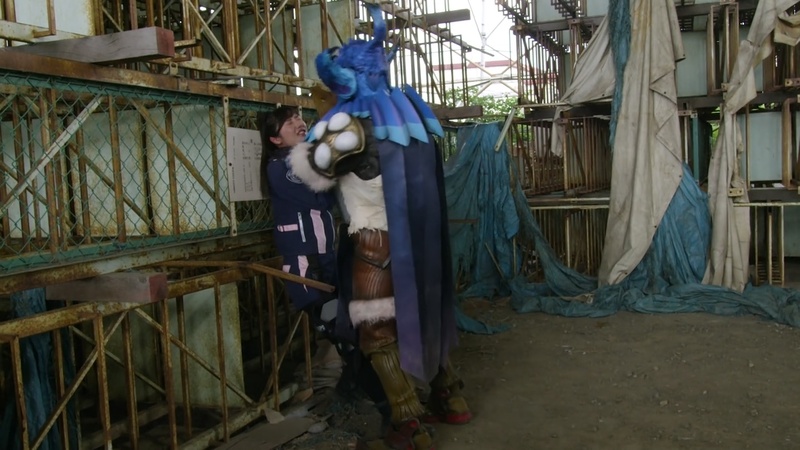 Tsukasa realizes what’s going on and she finds Noel to ask him why he would do this. Tsukasa insists Yoshi has really decided on turning his life around. Noel says he can’t answer any of her questions. Noel leaves and Tsukasa punches the wall. The Pats are driving Yoshi to the airport. Yoshi thanks Tsukasa for everything she’s done for him. Podamans suddenly attack their car. 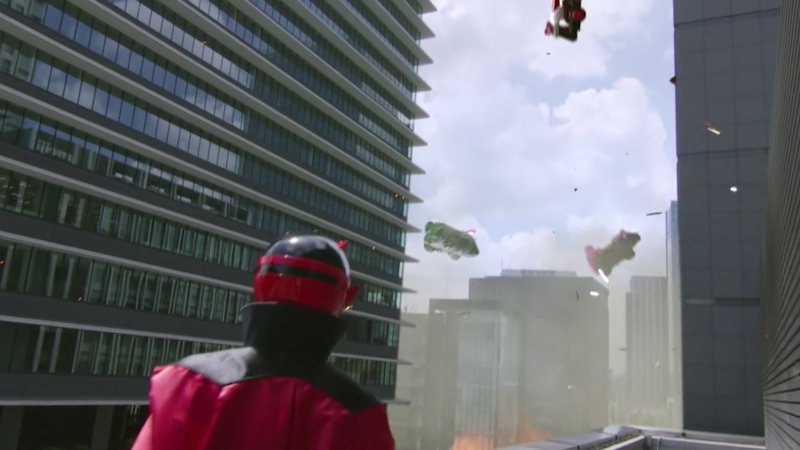 Keiichiro and Sakuya morph to take on the Podamans while Tsukasa takes Yoshi to safety. She tells him to run while she holds any Podamans off. Yoshi says he can’t leave her alone here. He wants to give her his Collection Piece. He places it in her hands, but a cuckoo clock bird suddenly pops out of Yoshi’s face and his demeanor changes. Yoshi doesn’t recognize Tsukasa at all and demands she hand over his Piece. She tries to ask what’s happened, but Yoshi tells her not to call him by his name since they’re not friends. He grabs her by the neck and slams her against the fence. Noel arrives and shoots at Yoshi to release Tsukasa from his grasp. Noel explains that the Collection Piece switches Good and Evil. That is, the more evil a person, the more good they appear with it. Tsukasa drops the Piece and of course Noel picks it up. “You knew this would happen!” Tsukasa says. She remembers his warnings to her earlier. Noel says even if Tsukasa was gullible, at least she was sincere about it. Noel morphs into Patren-X. Keiichiro and Sakuya arrive. “So there’s no such thing as a good Gangler after all?” Keiichiro declares. Tsukasa hardens herself and she morphs. She charges at Yoshi and the Pats take him on. 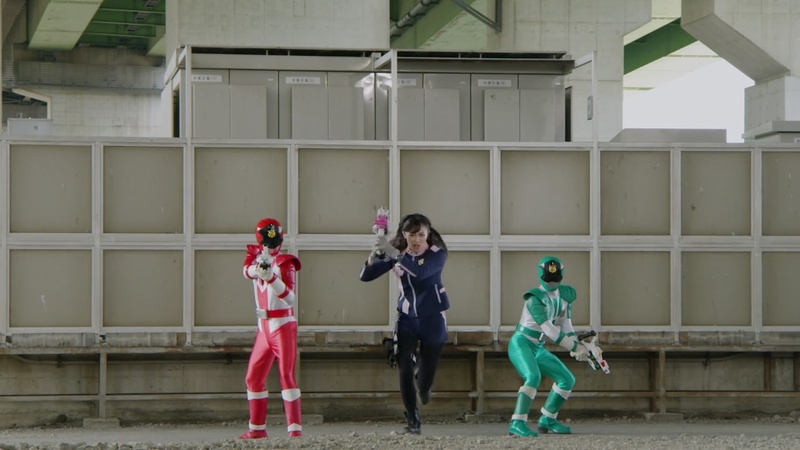 After Tsukasa Rider Kicks him, Good Striker flies in and they combine into Ugou. They deliver a One Hit Strike to finish off Yoshi’s first life. Goche’s creation from earlier appears and the Pats are surprised to see it with four safes all over his body. One of the Pieces undoes Ugou. Good Striker says that the Gangler has Bad Boys which weakens the entire Collection and cancels out Good Striker’s power. Goche appears and finds there’s nothing left in Yoshi’s safe. Oh well, she says. Tsukasa remembers Yoshi’s warning to her about Goche and safes. Goche slaps Yoshi’s safe onto the Gangler and fixes it before telling it to go rampage. The Gangler embiggens. Noel says this is Status Quintuple. Keiichiro shoots Good Striker who is unsure. They hop into PatKaiser as Noel tries to stop them. Keiichiro does not allow Good Striker to talk and they proceed to shoot a Bullet Strike at the Gangler only to have the attack blocked. The Gangler uses the multiple Pieces to easily attack PatKaiser. Keiichiro wants to go Strong, but the Gangler prepares a huge attack. Noel tells them to run, but it’s too late. The attack hits PatKaiser, they ungattai and get shot away. 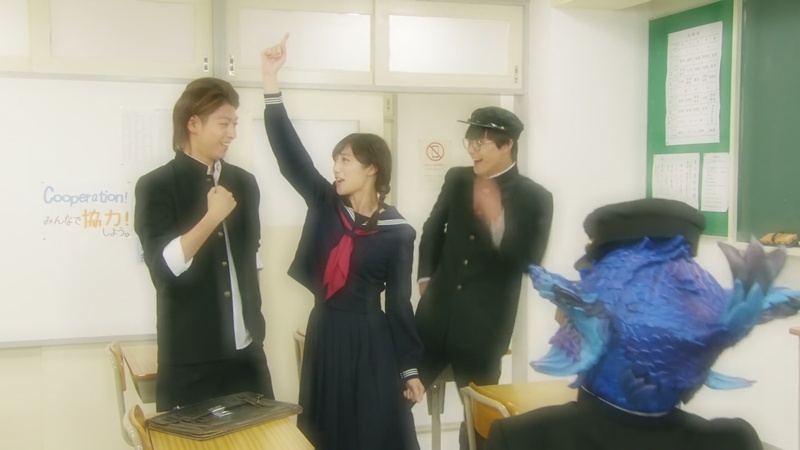 But the rest of the episode was very fun and something I always wish Sentai or Kamen Rider to do more off. That is, having nice, sympathetic MOTWs. I almost hate when they actually do it because it always ends badly or sad. Just like here where Tsukasa’s sincere feelings get stomped on and thrown in the trash. I think Sentai and Kamen Rider should do at least one of these every season. Having a villain monster of the week redeem themselves or something AND stay alive. 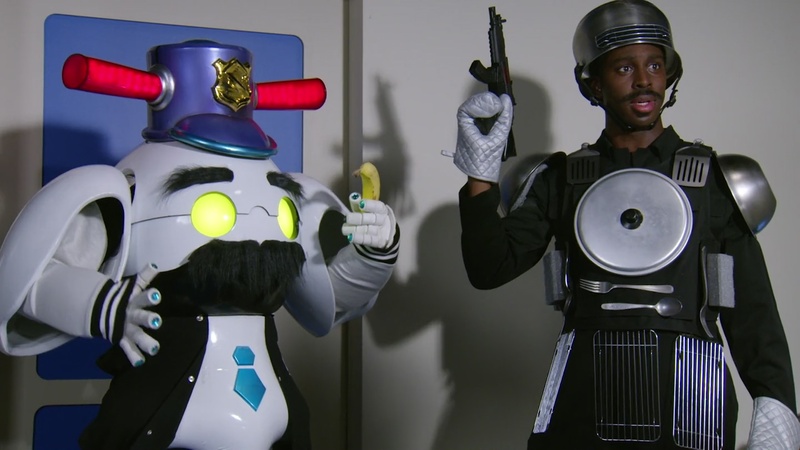 Jealoushitto is one of the best characters, period, of Sentai I’ve seen since I started watching. A comic relief MOTW that became a great recurring character. And then there’s the Roidmude that copied Kyu on Kamen Rider Drive. That was so emotional. It makes for a good story. And it adds to the character development of whichever regular character is the focus of that story. In this case, it was Tsukasa. 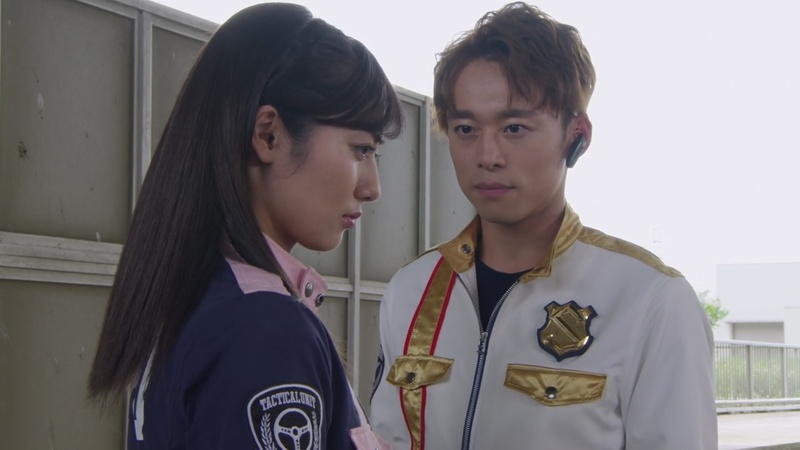 Ignoring the “You’re too gullible” aspect of her feeling for Yoshi (and even the Pats, Hilltop and Jim Carter’s trust in Yoshi as well), that she was compassionate while still being a good cop is certainly a great thing. My perfect conclusion to this episode would’ve been to have Noel proven wrong. That Tsukasa’s intuition (which has been touched upon a few times already this season, especially in relation to the kaitous) was actually spot on this time. And that the Pats actually do know how to be cops and are not bumbling fools. Since the main purpose of this episode was to set up Goche’s multi-safe Frankengangler, the good and evil opposites day Collection Piece could’ve easily been replaced with something else. Not only would it have been a refreshing story to have a truly reformed MOTW, it also would’ve added to Goche’s character as well. We’ve seen bits and pieces of how disgustingly evil she can be when it comes to experiments. I think she’s already killed many humans just to play around with her experiments, right? So torturing Yoshi and ripping safes off of his body would’ve definitely helped to solidify and illustrate just how evil Goche and the Ganglers can be. Emphasizing how evil the villains can be always helps solidify the heroism of our main characters as well. Tsukasa can be both compassionate and perceptive at the same time you know. The dressing up was also fun. The Commander Hilltop/Jim Carter scene was obviously the most amusing. Overall, for the most part, I enjoyed this episode. I wish it ended differently, but it was certainly the most fun I’ve had with LuPat in weeks.